Journalists should not make the mistake that Facebook is a better business than Google. I really believe Google can increase revenues by partnering with SearchForecast to become/facilitate a marketplace to buy/sell the millions of publishers you send checks to each month. The engine room of Google is their AdSense Publishers who contributed 30+% of their revenues. This global ecosystem of publishers is the long tail which helped built Google’s dominance in the past 6 years and is a strategic asset. SearchForecast can help leverage these publishers. This is why we launched http://marketplace.searchforecast.com – where AdSense Publishers can sell/buy their websites. It’s not just Google who need a future vision, it’s the publishers who need new management. To do this, many need to sell their websites and online businesses and have new people embrace their online business with new vigor and ideas. 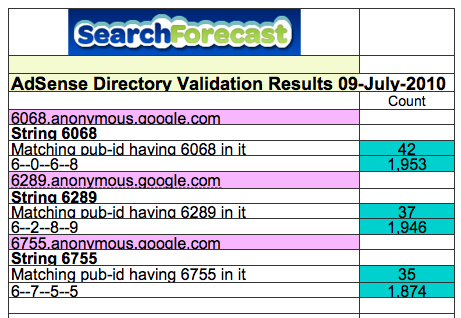 I’ve been updating the senior management of the major ad networks today that SearchForecast has been “de-anonymizing” the anonymous URLs Google show on their ‘placement targeting’ within Adwords for advertisers who spend money on their Content Network. As pictured here, we are providing to media buyers and advertisers a list of URLs which we believe are those URLs which Google run the ads on across their Content Display Network and 3rd party networks via the exchanges. 2. The second method is to use a standard bit encryption on our database of adsense id’s. So for example if the id is 654981, we run an encryption code sequence of 16 bit upon it. This gives us a alphanumeric character string of 16 characters. We then use the same code we used in the above example to run a combination. 4. Fourth method is to use an proprietary encryption sequence. The simple fact is that advertisers are spending with Google and don’t know where their dollars are being spent. Lack of transparency leads to market inefficiency affecting advertisers and agencies. Advertisers and large media buyers are welcome to contact us for further information on how we can provide more transparency when advertising across the Google Content Network. How do I sell iPhone Apps on SearchForecast Marketplace? With billions of iPhone apps downloaded and iphone app developers largely relying on word of mouth or the AppStore to list them in the Top 100, there is a massive supply of iPhone apps which need liquidity. SearchForecast’s marketplace to sell iphone app, aims to help solve that problem by allowing app developers to list their apps and facilitate an auction process. At SearchForecast, we make hundreds of phone calls each week for our adnetwork clients. After qualifying their websites from within the AdSense Directory, our internal sales team call the publishers. Listen to a Live Call Recording with an AdSense Publisher. Insight #1: Publishers are very polite, require little information to determine whether they are interested in learning more. Insight #2: Publishers want to earn more money and are not contacted by large adnetworks by telephone. Give up the online marketing techniques and call them! “Buy low, sell high” is long associated with buying stocks and property but when buying a website, its important to focus on buying websites at auction that are atleast 1 year old, have at least 6 months of stable revenues and importantly has not moved hosting servers. When SearchForecast optimizes websites, we are very aware that the host IP address is an important part of the optimization equation. We suggest people buying a website or those selling a profitable website, consider reviewing our list of website buying tips briefs as these hold insights into how to improve a website once you’ve purchased it but to also understand if the website has inherent SEO value. Yesterday, we launched the SearchForecast Marketplace allowing publishers – NOT domain names – to be bought and sold. Many AdSense publishers have built recurring revenue stream online businesses and are ready to sell their asset. Many buyers are looking to inject new ideas, enthusiasm and web 2.0 ideas into websites that have reached a point where the owners want to sell. It’s an inflection point in the evolution of contextual publishing. Over lunch in West Hollywood in Los Angeles today with Eytan Elbaz, one of the original founders of Applied Semantics which invented AdSense, we spoke about the empowerment AdSense gave to global publishers, how those monthly AdSense checks have enriched their lives and bring hope, understanding and help people learn about new cultures. We built the Marketplace so AdSense Publishers can realize their dream, capitalize on their entrepreneuralism and hard work with a pay day. We hope to attract buyers that aspire to joining the online publishing phenomena of passive monetization and bring new ideas to continue the growth of this industry. Millions of people have worked very hard to build their websites – not speculated in domains – and have labored daily to build valuable traffic. The SearchForecast Marketplace is another way we are embracing the publisher community and bring together people from around the world to learn, share and trade their websites. It’s a project for the publishers and we hope you all embrace and benefit from it…..